Let’s face it: denim shirt outfitsis not what you’d pick to make an impression. Too informal for the office, too simple for partying and not comfy enough for just fooling around. Why would anyone want to buy it? If you think we’re right on this one you might be terribly wrong overlooking this piece of clothes. Not sure about the ways to wear denim shirts? Well this selection of looks will give you a clue. Before getting to know about how to wear denim shirts you want to know something that’s even more fundamental than this and we’re talking about the importance of the hue. You’ve probably long figured out what shade of denim suits you best with jeans but chances are the rule’s not gonna apply to shirts. Try on various colors: from almost completely washed out to intense ink blue in order to work out the best option. BTW: Matching denim fabrics of different color and different texture is a risky move unless you go with the extremes: almost white denim top and extra dark blue bottom. 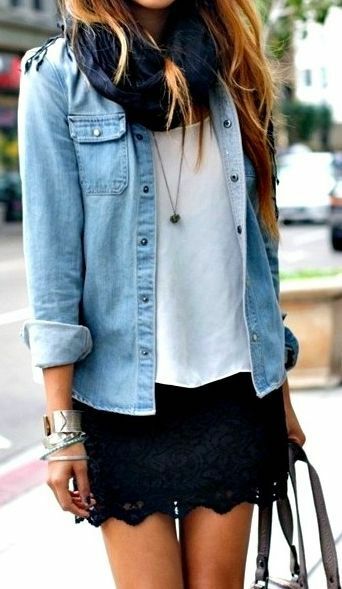 Ready for some cute denim shirt outfits? Then here’s what you can pair this staple with! Pants is the first choice cause they create an integral look in 100% of cases. It doesn’t really matter if it’s leather, jersey, canvas or linen – it’s bound to look good. The same goes for shorts! Skirts will look great whether they’re short or long, bodyconscious or loose, monochrome or flashy. There basically are no bad combinations here as long as you tuck the shirt in when needed. Great and useful everyday outfit — white tank bodycon dress with jean shirt. It’s better to wear the shirt loose with dresses though. Keep it unbuttoned and wear a long summer dress or even a bandage dress underneath it. Yet we don’t want to limit you in your choice so just have a fitting, find a dress you like and get it! 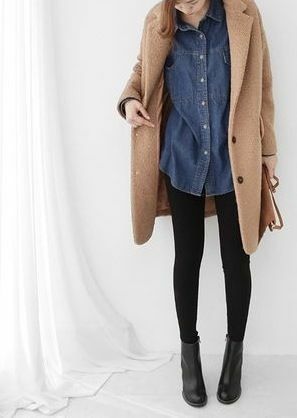 Sometimes you literally won’t need a thing to create a nice outfit: some denim shirts are long enough to double as a dress and boy they look good both with and without a belt. Sneakers or pumps – doesn’t really matter. When it comes to denim shirts you can probably wear every single pair you own now. Just chose the top and accessories wisely then. Thanks God denim goes well with all colors and most fabric textures – that’s exactly why a denim shirt can become a staple of your wardrobe and provide room for creativity! If you still find our denim shirt outfit ideas boring here it is: the ultimate fashion trend that can only be adopted by those who are lucky enough to own a denim shirt. And the trend is all about knotting shirts instead of wearing them loose or tucking them in. Why not knot any other shirt you say? Just google the pictures and you’ll see that regular knotted shirts seldom look nice and it’s denim shirts most of the photos on the net actually feature. 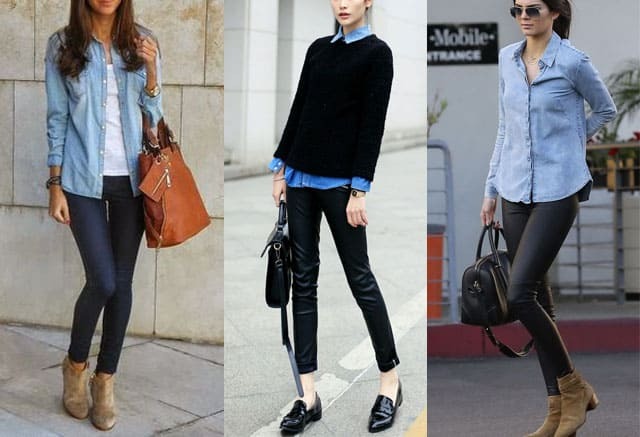 Here’s the question though: what to wear with denim shirts after you knot them? Well it basically changes nothing and the same clothes will make a great match that looked nice with the unknotted shirt. Yet the whole look somehow becomes completely different. We’d say there’s a feminine side to it now and also seems like you took a little bit time coming up with what you’re gonna put on today. 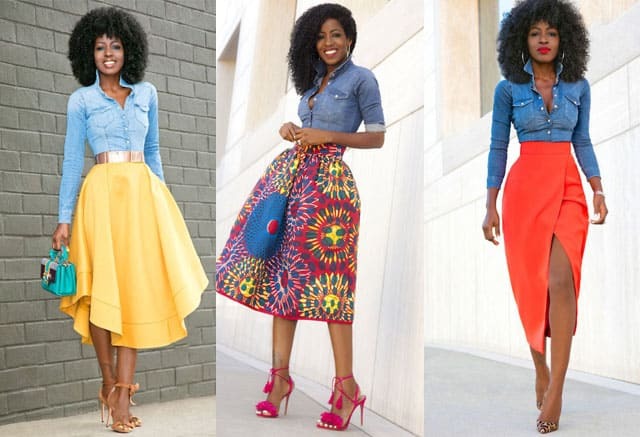 Our favorite looks here are those with light white cotton summer dresses and short black high waist skirts. OK OK maybe skinny leather pants would look nice too. Oh, and a tea length tulle skirt in pink or violet. God why is it so hard to pick just one? Tip: Knot the ends at any height you want: right below you breast for a sassy look, around the waist to look daring yet classy and down on the hips if you wanna create a relaxed laid-back style. Denim shirt and distressed jeans with suede black ankle boots is free, soft and light image. 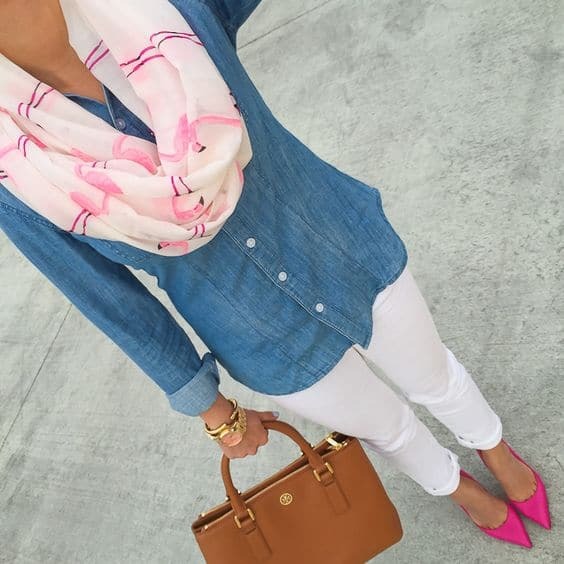 Sky blue denim shirt and magenta heels with silk scarf. Romantic and cute image.